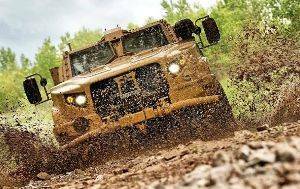 Oshkosh Defense, LLC, an Oshkosh Corporation (NYSE: OSK) company, will showcase the Joint Light Tactical Vehicle’s (JLTV) combat effectiveness against battlefield threats at IDEX 2019 in Abu Dhabi from February 17-21, 2019. Designed using lessons learned from the Mine-Resistant Ambush Protected (MRAP) All-Terrain Vehicle (M-ATV), the JLTV platform provides MRAP-level protection to mitigate the most prevalent threats while delivering best-in-class off-road mobility in a highly transportable package. The JLTV can be configured with many weapons systems, depending on the mission or threat environment. An optional turret supports standard weapons mounts for 7.62mm manned or remotely-operated machine guns or for a variety of cannon and tube-launched missile systems. Side- or rear-mounted weapons from a wide variety of manufacturers are also seamlessly supported. The JLTV General Purpose configuration on display is equipped with an EOS R-400S-MK2 Dual remote weapon station (RWS) integrated with Northrop Grumman’s M230LF 30mm lightweight chain gun to demonstrate the vehicle’s ability to support increased lethality including a medium caliber weapon system.